In the beginning… One dollar, per member, per week = 1-1-1! The English District is launching a new model for funding missions to which every congregation is invited to participate. It is completely voluntary, but we believe that as God's people see and hear what is being accomplished, specifically and directly in support and development of new missions and enhancing existing missions, more and more of us will want to be involved. It's simple. Very simple. It is NOT burdensome, nor sacrificial. It involves every baptized member of the Body of Jesus in your congregation, from the newest baby baptized to the oldest member. It demonstrates the power of the beautiful body of Christ working together, prompted by faith. It shows how much can be accomplished by many, giving little. Here's the plan: $1/per baptized member/per week. Simple, right? Self-explanatory almost. Not burdensome, nor sacrificial. All can participate. and all the members of the congregations who are supporting the English District Missions and for your participation in 111. 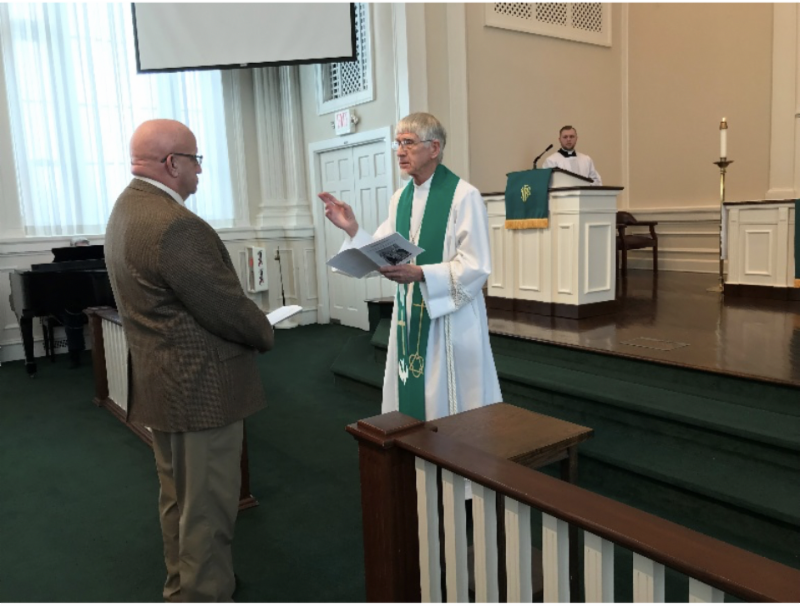 We are happy to share that the news that as of the beginning of March the District has received $25,437 from 29 of the 55 congregations participating in 1-1-1 and 6 individuals. Missions is what the Church is called to do, by Jesus. Fear can stop us of from dreaming big and doing great things. We are the body of Christ—working together. There is power and strength in many giving a little. The extra funds for missions that are raised will help support two missions. Young and old alike are making a difference! Won’t you join us? On Saturday, January 26th, members from both Mount Calvary, Lititz and Concordia canvassed over one hundred homes in a neighborhood in Myerstown. We told our neighbors about our church and left informational door hangers. in Myerstown. Concordia is blessed to use Evangelical’s chapel for worship. In addition to volunteering, Concordia had an information booth set up at the run. Both of these opportunities gave us the chance to make many community connections and tell many about our church. On Sunday, March 3rd, Concordia welcomed Brad as the newest member of our mission! Pictured are Rev. Jim Witt officially receiving Brad into Concordia and then some of our members celebrating Brad’s reception with cake at Bible study. Lutheran Church of the Risen Savior in Green Valley, Arizona, began the Dollar for Missions collection in September of 2018. By the middle of January 2019 (less than 5 months), $1444 had been collected over and above regular missions giving. ﻿It’s a fun, easy way to support the spread of the Gospel. This brings us to 55 congregations participating in 1-1-1. As one of the newest congregations in the English District, we have been truly blessed by our participation in its mission efforts, especially the 1-1-1 giving. Though we are a very small church, all our members have joyfully responded to the effort, especially our young. We are overjoyed in the stewardship catechesis this provides for them and all our people. We may be tiny, but quite a bit has been raised so far. We are so thankful to have this opportunity to contribute to the greater mission of the church. To God be the glory! This bring us to 54 congregations participating in 1-1-1. Join in the fun of helping us grow two Missions. The more congregations participating, the more support there will be for us to be able to touch lives with the Gospel of Jesus. Currently, the Midwest Region is at 42% with the Eastern Region at 41%. With Ascension of Christ joining the Lake Erie Region, bringing them up to 28% and the Western Region has 26% of their congregations participating.